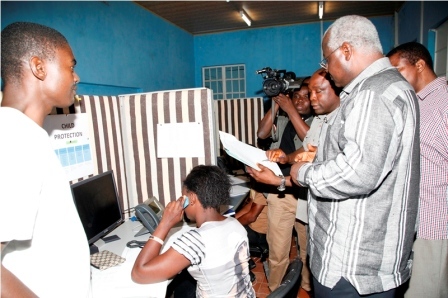 Freetown, 9 August 2014 – The President of the Republic of Sierra Leone Dr Ernest Bai Koroma, on Saturday, visited the Ebola Emergency Operations Centre (EOC) at the WHO Country Office in Sierra Leone. This is the second visit of the President in 10 days. He made true his promise during his first visit on 31 July that he would be following up on the emergency response activities of the EOC. 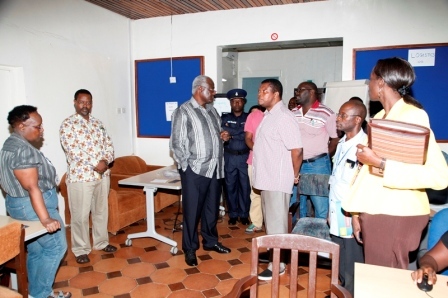 President Koroma enquired about various response structures including the treatment centres, the laboratories, contact tracing, the emergency call centres, the current status of stocks of Personal Protective Equipment (PPEs) and the training needs of the response personnel during his visit. The President expressed strong interest in the establishment of two additional treatment centres in the Western Area covering the capital city and its suburbs and another in the north to strategically locate treatment facilities for ease of access. He mentioned that there is an ongoing negotiation by Dr Margaret Chan the WHO Director General, for the establishment of an additional laboratory for the confirmation of cases. Currently, tests are conducted in two laboratories in Kailahun and Kenema which are the two epicentres of the outbreak. However the rapid spread of the disease to other parts of the country has necessitated the urgent need for additional treatment centres and laboratories to minimize the time for the laboratory confirmation of tests and transfer of confirmed cases (patients) to Kenema and Kailahun both of which are located far away from other parts of the country. During the briefing session, Dr Jacob Mufunda, WHO Country Representative updated the President on progress and challenges that are being experienced by the EOC as well as by the field teams. He stated that there are currently a stockpile of 30,000 PPEs that are enough for more than two months use. He further informed the President of plans by the Chinese government to provide additional 50,000 PPEs in the coming week. Meanwhile Dr Bannet Ndyanabangi, UNFPA Country Representative further informed the President of the ongoing training of 900 contact tracers to monitor people that have been exposed to the virus through infected relatives or family members or through other means. He noted that the plan is for each district to have at least 100 contact tracers. 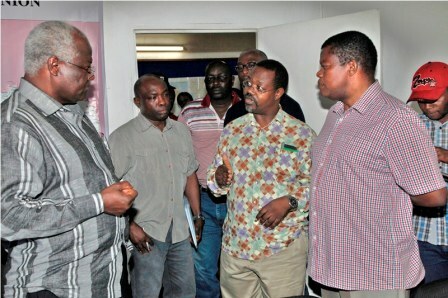 The President visited the 24 Hour Emergency Call Centre within the EOC work station where he received briefing on the operations of the facility. There were more than 10 emergency hotline telephone operators on one of the 3 eight hourly duty rosters at the time of the visit. The President was informed of the flow chart of queries raised by callers through the toll free numbers and the relay of information to the district surveillance officers who are accountable for triggering of required interventions. There is feedback to and from the caller about the outcome of the request. The President expressed satisfaction with the operation of the call centre. The EOC is the leading coordination centre in the Ebola outbreak response. The body meets every day to discuss the overall national Interventions, progress in the response, resource and logistical needs, as well as gaps and challenges at the national level. The meetings are attended mainly by top management of the Ministry of Health including the Minister who chairs the meetings, and heads of local and international response partners including the United Nations agencies, Doctors Without Borders, the Red Cross and other partners. The meetings are co-chaired by the WHO Country Representative.